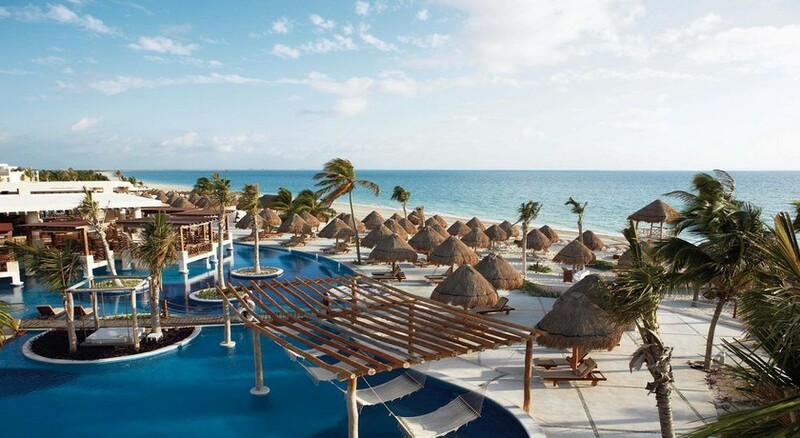 Excellence Playa Mujeres All Inclusive is an adults-only oasis of luxury situated on a gorgeous beach off the pristine peninsula between the Caribbean and Wetlands. Strategically located near an inland marina and gorgeous powdery white sand beach as well as the spectacular Greg Norman golf course, this resorts invites guests to experience immaculate luxury amidst posh amenities and warm hospitality. Endowed with an out of the world Miilé Spa, the hotel is perfect for a relaxing vacation. Ten international gourmet restaurants, bars and spectacular pools, this is an idyllic haven where all your needs are taken care of thanks to the all-inclusive package. 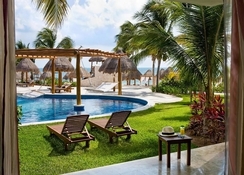 Make your exclusive Cancun beach holiday come alive at this wonderful resort. 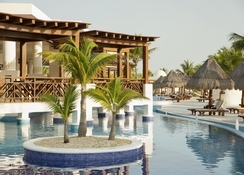 Excellence Playa Mujeres All Inclusive is located on a beautiful beachfront of the pristine peninsula between the Caribbean Sea and Wetlands, close to the Playa Mujres beach. The El Meco Archaeological site is located just 5km from the hotel. 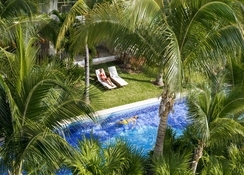 The Playa Mujeres Golf Club, only 4km from the hotel, can be reached within 15 minutes by car. 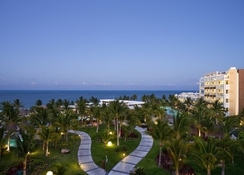 The Cancun International Airport is 28km from the property. This hotel has 450 rooms spread over four floors offering luxurious accommodation with state of the art amenities and gorgeous sea or pool views. 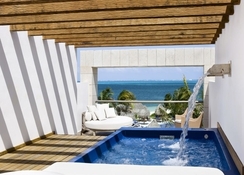 The suites at Excellence Playa Mujeres are spacious, chic and contemporary. These come extra-wide sectional sofa, flat-screen satellite TV, private Jacuzzi with indoor and outdoor access and four-poster beds. Rooms come in categories junior suite, junior swim-up suite, terrace suite, two-story rooftop terrace suite, junior suite pool view, junior swim-up suite pool view, junior suite ocean view, two-story rooftop terrace suite with ocean front, honeymoon suite w/private pool, imperial suite two-story rooftop terrace w/ plunge pool, honeymoon suite two-story rooftop terrace w/ plunge pool and imperial suite w/private pool. Prepare for a culinary adventure at Excellence Playa Mujeres All Inclusive with creative, healthy dining at ten international gourmet restaurants probably unmatched in Playa Mujeres. Check out the restaurants serving everything from Mexican to Med and Indian cuisine—at Agave, Barcelona, Basmati, Chez Isabelle, the Grill, Flavor Market, the Lobster house, Las Olas, Spice and Toscana. The All Inclusive package includes Breakfast, lunch and dinner, unlimited beverages, snacks and 24-hour-room service for guests. There are also eleven stylish bars, including ones at beach and pool, to enjoy your drinks in heavenly ambience. At Excellence Playa Mujeres All Inclusive, exclusive Aqua Wellness hydrotherapy circuit offers a series of water-based therapies to prepare you for exotic Spa treatments. The spa has several treatments and signature therapies from around the globe. Couples massages and treatments are part of the tailored Miilé Spa experience. You could also soak in the gorgeous pool, stroll on the beachfront or take excursions to nearby attractions.